♦ ACLX – Allows Initiator Group/Access Logix function on the port. ♦ Common Serial Number (C) – When enabled, this flag causes the serial number of a specific volume to be the same regardless of the port on which it is visible and also allows multi-path configurations. ♦ Unique WWN (UWN) – When enabled, ensures unique World Wide Names (WWNs) within the fibre environment by incorporating Symmetrix serial numbers and port numbers for each WWN. Enabled by default for all environment configuration changes and new environments. ♦ Init Point to Point (PP) – Specifies a point-to-point (direct or switched) topology. ♦ Enable Auto Negotiate (EAN) – With EAN enabled this allows the FA port to Auto Negotiate the port speed with the switch port it is connected to. 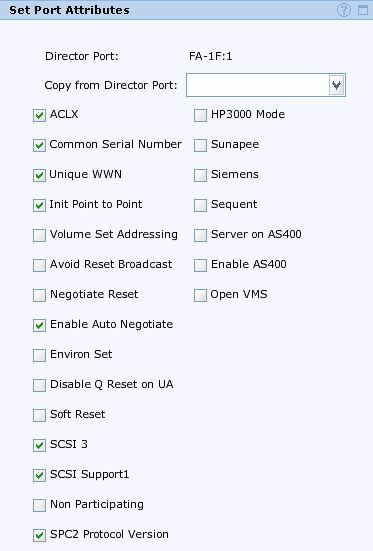 ♦ SCSI-3 Interface (SC3) – SC3 provides SCSI-3 (Full range of SCSI-3 commands) support for the ESX hosts. Also note that SC3 is required for Linux VM’s with RDM’s attached. ♦ SCSI Support1 (OS2007) – OS2007 enables automatic discovery of newly created LUNs/Paths. When Enabled, this flag provides a stricter compliance with SCSI standards for managing device identifiers, multi-port targets, unit attention reports, and the absence of a device at LUN 0. If using VPLEX 5.2 and higher, the OS2007 flag MUST be enabled. ♦ SCSI Primary Commands (SPC2) – This Flag is required in order for the FA port to conform to industry standards resulting in an NAA identifier being used for the LUNs presented to the ESX hosts. 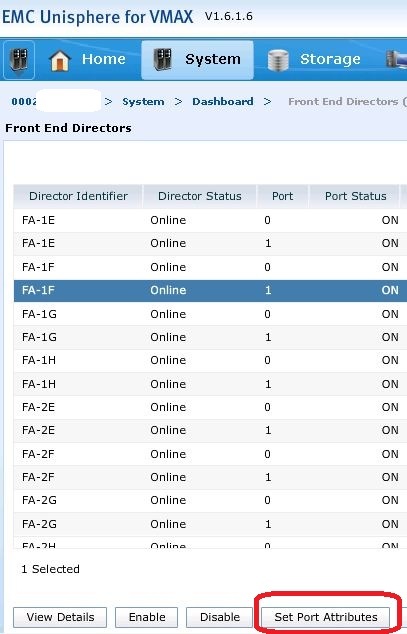 To change the status the Port must be offline. Note: These Flags may already be enabled by default for the associated Director Ports and no additional configuration change is required. Consulting the ESM for default settings will verify this. 1. Select the Symmetrix system. 2. Select System > Dashboard. 3. From the Hardware panel, click Front End Directors to open the Front End Directors list view. 4. Select the director, and click Set Port Attributes to open the Set Port Attributes dialog box. 5. Optional:Select a port whose flag settings you want to copy. While all the port flags described above can be set at a Director Port level, in some cases you may not want the enabled flags to affect different host types connected to the Port such as Linux or Windows, in this case it may be a better option to set the Flags at an Initiator Group level. By enabling the relevant host type Flag settings at the Initiator Group level you are only affecting the ESX Hosts included in the Initiator Group. In this way the flag settings for the initiator group override flag settings on the port itself, thus allowing for the port to be shared by servers with differing flag requirements. Note: If there is a requirement to enable SPC-2 in a live VMware environment then please reference EMC Support material; as doing so may result in a LUN UUID change, depending on the version of VMware. One such solution to overcome this problem was to create a new path and datastore then perform an svmotion. Also changing the OS2007, SPC2, SC3 FA flags then the hosts affected by these changes will require a reboot as the SCSI protocols in use will have changed at the FA level and the HBA needs to reinitialize communication with the FA.